(Kitco News) - Palladium – described as a tight market for some time now due to robust automotive demand – topped $1,400 an ounce for the first time ever on Thursday. A desk trader in the physical market said that at one point, palladium suddenly rocketed ahead by around $80 in three hours. Another dealer said prices then eased on profit-taking, but he looks for another test of $1,400. Spot palladium was $32.75 higher to $1,389.55 an ounce as of 11:11 a.m. EST. The metal peaked just above $1,431 overnight. This was $136 higher than the session peak in spot gold. TD Securities issued a research note saying palladium “is in a class of its own” right now. The sharp gains come on a day when the other precious metals – gold, silver and platinum – are all steady to modestly softer. “The metal, which is primarily used in auto catalysts, appears to be immune from changes in risk appetite as its structural deficit continues to power a surge in pricing — despite crumbling auto sales and concerns about a global growth slowdown which have otherwise caused sharp corrections across global markets,” TDS added. Afshin Nabavi, head of trading at trading house MKS (Switzerland) SA, pointed out that the palladium market is still in backwardation. For any commodity, this is when nearby contracts are more expensive than deferred. This is seen as a sign of tight supplies since buyers are willing to pay a premium to get the commodity right away. The London-based consultancy Metals Focus estimated that the 2018 global palladium supply-demand deficit was 1.1 million ounces. This means that the world’s above-ground stocks are being whittled down to meet demand, analysts explained. The big demand has come from auto manufacturers due to the use of the metal in catalytic converters. The industry’s use for palladium rose to 8.5 million ounces last year, up 47% from 5.8 million in 2010, according to Metals Focus’ data. George Gero, managing director with RBC Wealth Management, also cited strong demand from the auto industry, but added that some palladium is also used in the energy industry. Much of the metal right now is in the form of a sponge, a powdery substance use for industrial purposes. “You’ve got a bit of a shortage in deliverable bars,” Gero said. Buy stops were triggered early Thursday, accelerating the price ascent sharply in thin trading conditions, Nabavi reported. Stops are pre-placed orders activated when certain chart points are hit. “Overall, it feels like we may be in for another test of $1,400,” Nabavi added. 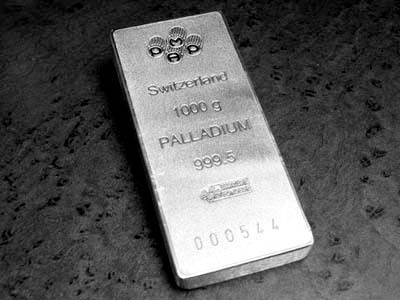 Analysts with the Hightower Report said palladium “continues to defy gravity” and could become an investment “fad” since it now has a premium to gold. “In other words, it is possible that palladium’s own momentum will result in even more gains directly ahead,” they said. Commerzbank analysts commented that palladium investors appear to be ignoring some of the weaker sales figures in all of the major auto markets lately. “Instead, they are seeing news such as the planned widening of a strike to include the platinum mines of a major South African gold and platinum producer as being a good reason to buy,” they said. The country is also a major palladium producer due to mining of the metal as a by-product in platinum mines. BMO analysts said some of the recent strength in palladium has been driven by yet another supply concern – the U.S. Congress “pushing back on efforts to ease sanctions on Russia.” Concerns about palladium supplies from Russia sometimes develop during U.S.-Russia disputes since Russia is a major palladium producer and investors worry that these issues could restrict the flow of metal. O’Neill said a key question for the market may be whether palladium prices have soared so much that auto manufacturers will start substituting more less-expensive platinum into catalysts. Because car sales have shown some signs of sluggishness, manufacturers may not have been as aggressive in shifting metals as might otherwise be the case, he added. In a research note earlier this week, Metals Focus said there is potential for a profit-taking pullback in the near term after the sharp run-up in palladium prices. But the consultancy firm otherwise remained upbeat on palladium. “Indeed, we believe that this trend will continue into 2020 and beyond, as persistent deficits push the palladium price through new record highs,” Metals Focus said.